One of my all time favorite online survey sites is Swagbucks, and in this Swagbucks review, I’m going to answer all your questions about Swagbucks, so you can make an informed decision as to whether it’s the best survey site for you. I’ve been using Swagbuck for quite some time now and feel I’m in a good position to explain just what is Swagbucks and all the other little Swagbucks tips to make it worth your while. In this Swagbucks guide, I will cover a range of things such as how does Swagbucks work, is Swagbucks worth it, what’s the best way to earn Swagbucks and the common questions – is Swagbucks safe and how much can you earn? After you read this guide you’ll have all the information you need in order to learn why you should sign up to Swagbucks now! Click here to get started with Swagbucks survey right now! Is Swagbucks Legit And Safe? Before joining a platform such as Swagbucks, it’s valid to question is Swagbucks legit and safe? I mean you don’t want to be spending your time completing surveys just to find out it was all for nothing. Like with all survey sites like Swagbucks, I did my due diligence before signing up and read various online reviews which discussed how legit is Swagbucks. As mentioned, I have been using Swagbucks for a while now and am happy with the platform, but in preparation for this article I did some research to see what other online reviews are currently saying regarding the big question – “Swagbucks, is it legit?”. I’m pleased to say that the overwhelming consensus is YES – Swagbucks is still legit and safe to use. In fact many reviews state that it is one of the most legitimate survey sites currently on the internet. You can even check the Better Business Bureau (BBB) which is an organisation that sets a level of standards for business to strive for. The BBB then provides a rating for the business based on how well they perform against these standards. Swagbucks is a business owned and operated by the company Prodege LLC which has been accredited by BBB with a A- rating. It’s worth noting though, that I did stumble across some information that there are some sites pretending to be Swagbucks, so to avoid this Swagbucks scam, I recommend if you want to join you ensure you sign up to the real deal – this link will take you to the real Swagbucks site. Well of course you’re not, but this is the case with any survey site. A more relevant question should be “will I earn decent points from completing surveys that I can cash in for various rewards and not be duped?” The answer to this is absolutely. So the next big question – how to get Swagbucks, the currency used by Swagbucks. To access the Swagbucks paid surveys, simply go to their home page, enter in your details and away you go, you’re ready to start to make money with Swagbucks. During the sign up process you will be required to enter in some details that may seem a little bit personal such as your income, who lives in your household etc – but this information is used to better match you with surveys, so don’t skip this as it’s important! This is how Swagbucks works – once you’re all signed up, Swagbucks will start sending you survey opportunities and other offers which match your demographics. What opportunities you decide to take up is entirely up to you. For a Swagbucks mobile friendly version of their website, I highly recommend you download the Swagbucks Apps – it’s compatible with Android or iOS smartphones. There are two Apps, the general Swagbucks App which will allow you to easily complete Swagbucks surveys no matter where you are, as well as the Swagbucks TV App so you can watch their videos via your mobile. Whether you have a long commute to work, are waiting in the Doctor’s surgery or even in line at the grocery store, you can be earning Swagbucks! 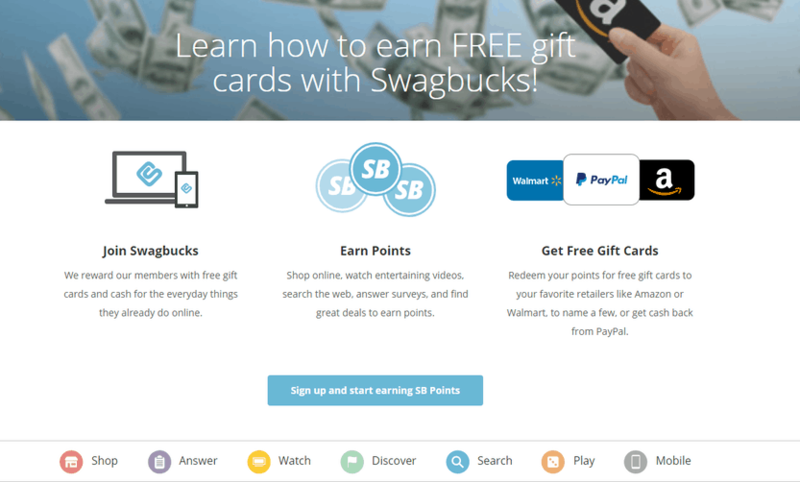 With Swagbucks you earn “Swagbucks” through a range of activities such as completing surveys, surfing the web, playing online games and watching videos. Completing surveys tends to be the best use of your time with a survey earning you anywhere between 1 and 1000 Swagbucks. However, on average except to earn around 40 to 100 Swagbucks per survey. Usually the longer the survey will take, the more Swagbucks you will earn. The number of surveys you can complete each day depends on your eligibility. Your eligibility will usually depend on your demographics and whether it matches the type of person the survey is targeting. Usually, this will be determined in the first few questions of the survey. Compared to other similar sites, Swagbucks certainly is one of the most popular sites to join. This in itself ensures there are a great number of surveys and other opportunities available at any one time, plus the options when it comes to redeeming Swagbucks is much greater. Searching the web: Use the Swagbuck search engine instead of Google to do your daily internet searches. Play games: Play games on their site like Wheel of Fortune and Bejeweled Blitz and earn around 1-10 Swagbucks per game. Not a lot but why not earn some points if you’re going to play them anyway. Watch Videos: Yes you can watch videos on Swagbucks TV and earn Swagbucks. You don’t even need to actively be watching them; just start a playlist and have them going in the background whilst you’re working on something else. Daily Poll: Get 1 Swagbuck by completing a quick question on a random topic. It will only take you a second or two. Refer a friend: Refer a friend and get 10% of their lifetime earnings. So for example if your friend earns 50 Swagbucks you will receive 5. Winning!! Online Shopping: Get cash back in the form of Swagbucks by shopping online at over 1500 retailers such as like Amazon, Macy’s Target and Walmart. If you’re going to buy things anyway you might as well earn something for it. Often Swagbucks will offer double and triple points too. Trial Offers: Join up to certain trial offers through Swagbucks and be rewarded with Swagbucks. Sometimes the trials are free to join other times they cost to join. Meet Your Daily Swagbucks Goal: Swagbucks will set you a daily minimum goal of Swagbucks to earn and, if you reach this goal, they will give an extra 10%. Hourly Random Winner: Whilst you’re logged into Swagbucks, if you see your username pop up in the hourly random winner section – click on and claim some bonus Swagbucks. Follow Swagbucks on Social Media: Every now and again Swagbucks will release special codes on their Facebook, Instagram or Twitter page where you can enter the code in your SwagButton and earn additional Swagbucks. So we know how to earn Swagbucks, but you’ll want to know how much are Swagbucks worth and how does Swagbucks pay you. Firstly – how much is one Swagbuck worth? Well that depends on what you exchange your Swagbucks for. You can redeem your points by either shopping in the Swagbucks store or redeeming them for gift cards. Given you need 300 Swagbucks for a $3 Amazon voucher, this values Swagbucks at 1 cent each. You can redeem your Swagbucks for a range of things, with the most being gift cards. However you can also get paid cash into your PayPal account. If you’re wondering how to redeem Swagbucks for cash, first up you’ll need to be aware that the minimum cash payment is 2500 Swagbucks for $25. As to how long it will take to build up enough Swagbucks to have enough to redeem a gift card or get paid cash really depending on how much time you have to complete the various activities. You can see that if you spent a little bit of time on the platform each day, you could easily have in enough for a $3 Amazon voucher within a few days. The more time you have free, the more Swagbucks you can earn. 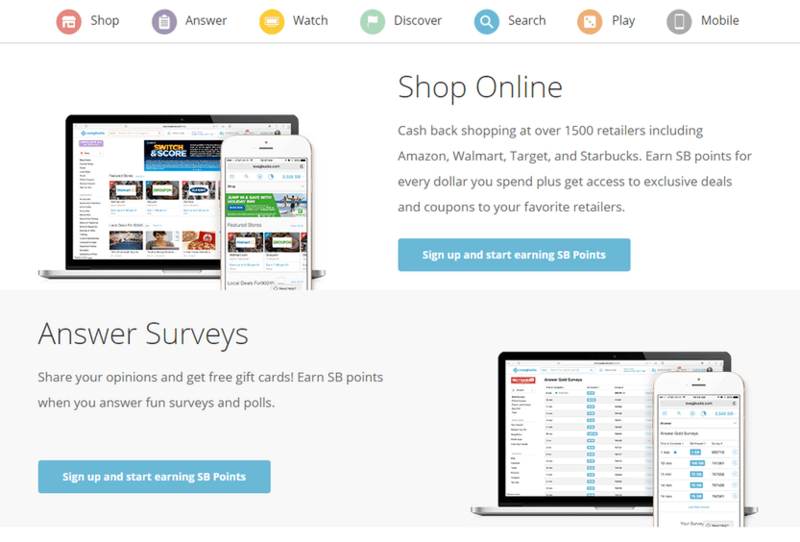 If you want a survey site that provides you with loads of opportunities to earn points, Swagbucks is a great option. Even if you’re not really keen on surveys but playing games and watching videos are your thing, Swagbucks will work great for you. It’s particularly good for using during that long commute to work each day to earn points and cash – and have fun while you do it. Whatever your preference for earning points, you can do it with Swagbucks. If you’re interested in trying it out, sign up with Swagbucks today – you’ve got nothing to lose from earning Swagbucks right now! Find the highest paying survey sites here or ones that pay cash here. 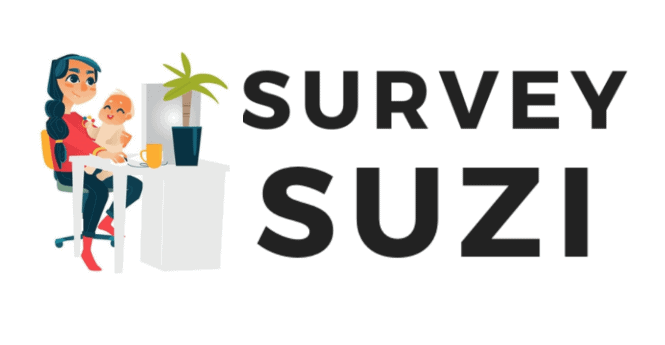 Suzi is a stay at home mom who juggles earning money online whilst raising 2 kids. She's passionate about continual self development for the benefit of herself and others.